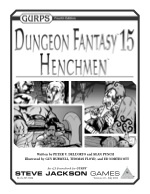 Many of the henchmen in GURPS Dungeon Fantasy 15: Henchmen can be thought of as "stripped-down delvers" -- lesser versions of the mighty 250-point templates that Dungeon Fantasy otherwise assumes. But then there are some that obviously don't equate to anything that was ever intended to be a PC. Examples include the laborer, the servant, and . . . the torch-bearer (p. 25). Yes, the torch-bearer, whose entire reason for existence is to act as a mobile light source -- and who's been given a bargain price as an Ally (a base cost of only 1 point!) to make this feasible. You are a member of the ancient order of Lightbringers, sworn to keep darkness at bay, and trained in the secret art of torchcraft. You fearlessly face the monsters in the shadows while using your keen eyes (and other senses) to stay aware! 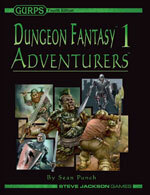 You frequently find yourself leading the party so they don't stumble forward blindly; because of this, you are adept at spotting dangers and (if necessary) mapping. Attributes: ST 12 ; DX 13 ; IQ 12 ; HT 13 . Secondary Characteristics: Damage 1d-1/1d+2; BL 29 lbs. ; HP 12 ; Will 13 ; Per 15 ; FP 13 ; Basic Speed 7.00 ; Basic Move 8 . Advantages: Improvised Weapons (Torches) (below) ; Torch Blessing (below) ; and Unfazeable . • Another 10 points chosen from Asbestos Hands* 1-2 [1/level], Higher Purpose (Illuminate the darkness) , Night Vision 1-9 [1/level], Not Without My Torch* , or Shtick (Last thing under)* . • A further 30 points chosen from the previous traits or ST +1 or +2 [10/level], DX +1 , IQ +1 , HT +1 , Will +1 or +2 [5/level], Per +1 or +2 [5/level], Basic Move +1 or +2 [5/level], Absolute Direction , Acute Vision [2/level], Alcohol Tolerance , Breath Holding 1 , Danger Sense , Eidetic Memory , Fit  or Very Fit , Hard to Kill [2/level], Hard to Subdue [2/level], High Pain Threshold , Intuition , Lifting ST 1-3 [3/level], Luck  or Extraordinary Luck , Magic Resistance [2/level], Peripheral Vision , Rapid Healing , or Temperature Tolerance 1-3 [1/level]. Primary Skills: Cartography (A) IQ -12; Observation (A) Per -15; Search (A) Per -15; Shield (Buckler) (E) DX+1 -14; Stealth (A) DX+1 -14; Throwing (A) DX -13; and Traps (A) IQ+1 -13. • One of Axe/Mace or Broadsword, both (A) DX+1 -14; or Flail (H) DX -13. • Either choose a second weapon skill from the previous list or spend 4 points to raise existing skill by one level. Secondary Skills: Brawling (E) DX+1 -14 and Wrestling (A) DX -13. • Four of Fast-Draw (Torch) (E) DX+1 -14; Acrobatics (H) DX-1 -12; Gesture (E) IQ+1 -13; Shadowing (A) IQ -12; or Body Language, Lip Reading, Survival (any), or Tracking, all (A) Per -15. Background Skills: Five of Forced Entry or Knife, both (E) DX -13; Climbing (A) DX-1 -12; Area Knowledge (any) or Seamanship, both (E) IQ -12; Gambling, Heraldry, Merchant, Occultism, Streetwise, Teamster, or Weather Sense, all (A) IQ-1 -11; Poisons (H) IQ-2 -10; Carousing (E) HT -13; Hiking or Running, both (A) HT-1 -12; or Intimidation (A) Will-1 -12. * See Henchmen (p. 25). Improvised Weapons (Torches): You suffer no penalty to use light sources as weapons. Treat a torch as a light club (Broadsword skill), a lantern as a small mace (Axe/Mace skill), and a chained lantern as a morningstar (Flail skill). All also inflict a linked 1 point of burning damage when lit, but have a 50% chance of going out per attempted attack (unless you used Torch Blessing). 1 point. Torch Blessing: Burning Attack 1d-3 (Accessibility, Lanterns and torches only, -40%; Cannot be used again until Cyclic duration expires, -25%; Cosmic, Lingering effect, +100%; Cyclic, 31 10-second cycles, +1,500%; Melee Attack, Reach C, No Parry, -35%) . Notes: With a single Ready maneuver, you can light a torch or lantern (if unlit) and guarantee it will remain lit even if used as a weapon, subjected to high winds, or submerged! Mundane measures cannot snuff the torch, and if a spell or power does so, the torch will relight itself automatically 10 seconds later. The blessing lasts five minutes. You may only bless one torch at a time. 16 points.